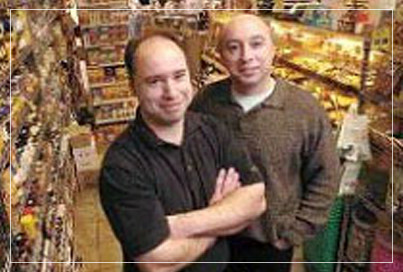 Vincenzo’s is owned and operated by brothers Tony and Carmine Caccioppoli, 2nd generation Caccioppolis in Canada, since 1967. Located at the Bauer Building, corner of Allen and Caroline Streets in Waterloo, Ontario. It has been over 5 decades since Vincenzo and Rita Caccioppoli opened up a small business in their home on Bridgeport Road, Waterloo, called: Italian Canadian Foods. In 1967, because of Vincenzo's longing and passion for the fine foods of his homeland, he started selling various foods primarily to the small Italian Community in the Kitchener-Waterloo area. Vincenzo's goal was to keep prices low and provide excellent customer service. It wasn't long before word spread about the small store, and Vincenzo was soon bringing in many new foods from other Mediterranean countries for his new customers. Soon, the store needed to grow and in 1992 the business was moved to 740 Belmont Ave. in Kitchener. In honour of Vincenzo, (who passed away that year) the business was renamed to: Vincenzo's Fine Foods. January 2010 saw yet another move to 150 Caroline St. South, which brought the business back to Waterloo, it's current location. "In search of a better life..."
What was he thinking of that day in the summer of 1951 as he stood motionless looking out over the Gulf of Naples? With the warmand passionate rays of "O Sole Mio" guiding him up the ramp and onto the deck of the great ship," The Argentina." Was he apprehensive as he looked out and waved "Arrivaderci" to his sacred Vesuvio and to his family that had gathered on the shoreto bid farewell to a brave son and soldier. Was he fearful of venturing out to the new world as had Cristopher Colombus, a native sonor simply afraid of remaining in an impoverished post war Italy with no future in view. Staring out to shore, did he perhaps memorize every expression on the faces of his beloved "Napolitani", a people full of love, a zest for life and a passion for singing. Contact Vincenzo’s. Visit our store. It’s a lifestyle. The Vincenzo’s lifestyle.